North Korean leader Kim Jong Il proposed Wednesday to extend his summit with South Korea's president for an extra day, raising hopes for progress at the first meeting between the countries in seven years. However, South Korea declined an offer by North Korean leader to extend the summit. Earlier, Kim had proposed that his summit with South Korean President Roh Moo-hyun continue beyond its scheduled Thursday end. But a pool report from South Korean reporters, which did not cite any source, said the meeting would end Thursday and that the two leaders would announce an agreement that morning. South Korean President Roh Moo-hyun said he sought common ground with Kim as they opened formal talks in Pyongyang for only the second-ever summit between the divided Koreas. "We didn't reach consensus on everything. There were parts on which our perceptions coincided, and there were other parts" on which the perceptions didn't coincide, Roh said at a luncheon with the South Korean delegation after two hours of talks with Kim, according to pool video relayed to Seoul. "However, what I clearly confirmed is that (Kim) has a firm will about peace and there was consensus that there should be an agreement this time that presents a future direction about peace," Roh said. When the two leaders resumed meeting after lunch, Kim proposed that the talks be extended to Friday beyond their scheduled Thursday close, South Korean presidential spokesman Yoon Seong-yong told reporters in Seoul. Kim said that Roh should delay his Wednesday schedule to Thursday, when the two leaders could share a casual lunch. Yoon said Seoul officials were considering the offer, and that they interpreted it as Kim's desire for the talks to proceed in a "more substantial way." Roh acknowledged that Pyongyang, one of the world's most isolated nations, was taking a cautious approach in opening up to its capitalist neighbor. "North Korea still has some skepticism about the South, and doesn't trust it enough," Roh told the luncheon. "We have to make more efforts to further tear down this wall of distrust." He also said the North expressed regret that the international standoff over its nuclear weapons programs had prevented greater economic cooperation with the South. As the summit started, Roh and Kim briefly mentioned recent floods in the North that left about 600 people dead or missing and tens of thousands homeless and prompted North Korea to delay the summit from its original August date. Before the talks at a state guesthouse in Pyongyang, Roh presented the North Korean leader with gifts including a bookcase full of South Korean DVDs, featuring popular soap operas and productions starring Lee Young-ae, believed to be Kim's favorite starlet. Kim appeared animated and smiled repeatedly Wednesday as he greeted Roh _ a contrast from his dour demeanor Tuesday, when the two first met briefly at an outdoor welcoming ceremony after the South Korean president arrived by road in Pyongyang. At the only other inter-Korean summit, held in 2000, then-South Korean President Kim Dae-jung flew to the North. "President Kim Dae-jung flew to Pyongyang. It seems to be more meaningful that you crossed the Military Demarcation Line on foot," Kim Jong Il told Roh, referring to the cease-fire line dividing the peninsula, according to South Korean presidential spokesman Cheon Ho-seon. "I was moved as I crossed," Roh answered. The summit comes amid a hiatus in separate international talks on North Korea's nuclear program, as the six countries involved consider a draft agreement requiring Pyongyang to disable its weapons facilities by the end of the year. It shut down its sole operating reactor in July. The main U.S. negotiator at those talks, Assistant Secretary of State Christopher Hill, said the U.S. had approved the draft and that other countries at the arms talks - China, Japan, Russia and the two Koreas - were expected to approve it before it was made public in the next few days. Once the agreement is signed, Hill said the reactor's disabling could be started "in a matter of weeks" - rendering it unable to be easily restarted to make more plutonium for bombs. Next year, the U.S. wants the North to abandon its fissile material - paving the way for peace talks to finally formally end the Korean War. 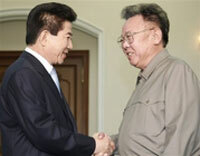 South Korea's Roh has also said he will campaign for peace at the Pyongyang summit. But it remains unclear what he could accomplish, because any treaty talks would have to include the U.S. and China, which also fought in the conflict. South Korea never signed the 1953 armistice that halted the three-year war. Roh was slated to view an evening performance of the North Korean propaganda spectacle known as the "mass games." Such shows feature thousands of synchronized gymnasts, and a giant mural formed by children turning colored pages of books. Conservatives have criticized Roh for going to the show, which extols the purported virtues of the North's communist regime.